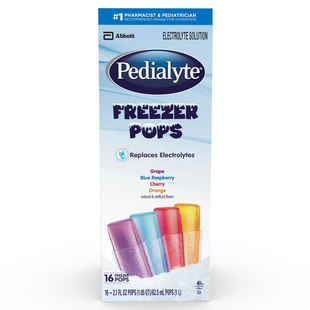 PEDIALYTE FREEZER POPS are an advanced rehydration solution specially formulated with an optimal balance of sugar and electrolytes needed to help replenish vital fluids and minerals which, when lost, can lead to dehydration. They can help prevent mild to moderate dehydration caused by vomiting, diarrhea, exercise, travel, and heat exhaustion. Use under medical supervision for the dietary management of mild to moderate dehydration during diarrhea and vomiting. Available in a variety pack (Grape, Blue Raspberry, Cherry, Orange). Not for use for children under 1 year of age. For children 1 year and older and adults: Offer Pedialyte Freezer Pops as frequently as desired. To maintain proper hydration, 16-32 Freezer Pops (or a total of 32-64 fl oz of any Pedialyte product) may be needed per day. Consult your doctor if vomiting, fever, or diarrhea continues beyond 24 hours or if consumption needs are greater than 32 Freezer Pops (64 fl oz) per day. Freezer Pops can be consumed without freezing, but the flavors are best when frozen. Note: Like colored ices, Pedialyte Freezer Pops may temporarily color mouth. Remove Pops from carton and freeze before separating. Tear or cut carefully between sleeves along perforations. With clean scissors, cut off top of sleeve. Push up Pop from bottom of sleeve. Cut off top of sleeve and pour liquid into cup or glass. Do not reuse plastic sleeves. Store unopened pops in cool place; avoid excessive heat. Grape (Water, Anhydrous Dextrose; Less than 2% of: Citric Acid, Salt, Cellulose Gum, Potassium Citrate, Potassium Sorbate (Preservative), Sodium Benzoate (Preservative), Natural & Artificial Flavor, Sucralose, Acesulfame Potassium, Red 40, Blue 1), Blue Raspberry (Water, Anhydrous Dextrose; Less than 2% of: Citric Acid, Salt, Cellulose Gum, Potassium Citrate, Potassium Sorbate (Preservative), Sodium Benzoate (Preservative), Natural & Artificial Flavor, Sucralose, Acesulfame Potassium, Blue 1), Cherry (Water, Anhydrous Dextrose; Less than 2% of: Citric Acid, Salt, Cellulose Gum, Potassium Citrate, Potassium Sorbate (Preservative), Sodium Benzoate (Preservative), Natural & Artificial Flavor, Sucralose, Acesulfame Potassium, Red 40), and Orange (Water, Anhydrous Dextrose; Less than 2% of: Citric Acid, Salt, Cellulose Gum, Potassium Citrate, Potassium Sorbate (Preservative), Sodium Benzoate (Preservative), Natural & Artificial Flavor, Sucralose, Acesulfame Potassium, Yellow 6, Red 40).